So that being said, this will be the last post in this series, because I've been itching to write about more than just marriage! I thought it might be fun to end on a lighter note and tell you all a few bits and pieces from our love story. 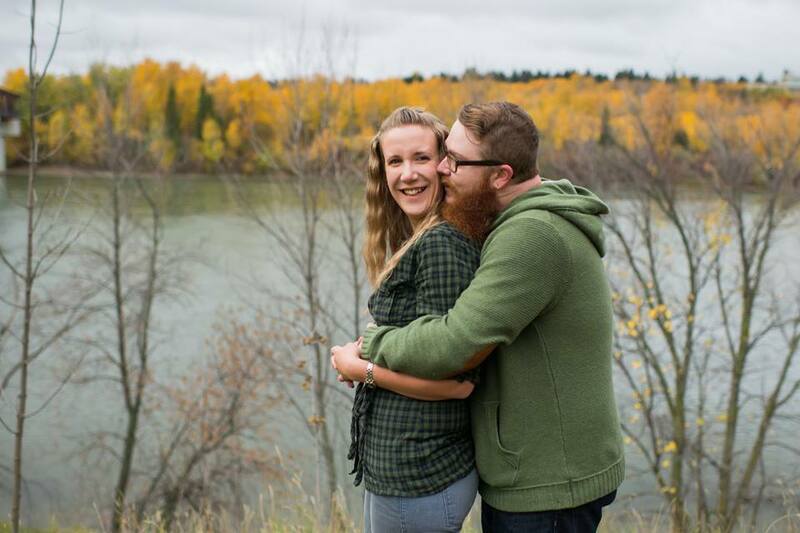 When we got engaged we decided to make a Wedding Website to have a place where people could connect with us and refer back to if they needed details like where we were registered etc. This website also had a bunch of mushy stories- Chris and I both wrote our version of our first date on this website, and I thought I'd share that with you today. So after a few weeks of writing facebook messages to each other everyday he finally asked me out. He asked me if I'd like to go to see a local band and I agreed. First we went for coffee, then headed to a place called the ARTery on Jasper Ave. Problem was, we had NO idea where this place was. We had an address, but that didn't seem to help. So there we were walking on Jasper Ave around 9 pm finding ourselves in a slightly seedy area making jokes about peeps shows and feeling a little lost. On the way he suddenly stops, looks at us and asks "Hey, are you two on a date?" Well... we hadn't officially said "date" when planning the night so we're both like "Uuhh.." and then Chris says "We're uuhhh... hangin out" So I agree "Ya... hangin out" That settles it right? Someone asks point blank if we're on a date or not and Chris doesn't say yes, so we must not be... right? That's what I thought, until we get there and he pays for my admission! What?? So it's not a date, but it sort of is. Ok. A (Non)Date then. Christian Hansen played, and was awesome, but both of us were too nervous to dance (or show any emotion really), so we awkwardly stood beside each other, without moving during the entire energy-filled crazy-fun set. Afterwords I told all my friends it was the best date I had ever been on in my life, even though I was pretty sure it wasn't a date! Alright, First off, I remember being pretty excited to get together with Melissa on this particular evening. It was perfect, first we would go for coffee, then we would go see Christian Hansen at this cool hip little place (that I had never been to, but thought any place called the ARTery had to be cool). For me one of the most eventful parts of the evening was walking to the venue. I was so confident I could find it. I even had the address written down on a piece of paper in my wallet just in case. Melissa and I started our journey down Jasper Ave toward where I Thought the ARTery was and all of a sudden we were lost (ish). I know! Every man's worst nightmare, being lost on a (non) Date. Melissa and I were walking right into sketch town just after the Shaw centre and I was starting to worry a bit. I wasn't really liking the idea of taking a lady on a (non) date through that kind of a neighbourhood. All of a sudden Doug just pops outta nowhere. D "Hey guys! what are you up to?" M&C "Hey Doug! We are trying to get to the ARTery." D "Me too! Follow me, I'll show you how to get there. Sometimes you have to go through the back door." C *Thinking* "Back door around here?" D "Wait. You guys on a date?" C "Nope just hangin out"
So we eventually brave the uneasy surroundings until we end up at the back of the ARTery. I decide to pay the cover for both of us. Guess it just seemed to be the right thing to do. The evening couldn't have gone better (for a non date) we ended up talking a lot through the night after we found the only spot we could sit, right by the back door. Doug would pop in every once and a while a little intoxicated and would apologize for ruining our night. I remember this being the first time I had seen CH play in a long time and I remember that they went so crazy on stage that you would have to be a statue not to jump and dance around... Just like us. Maybe that's what happens when you fall in love with someone (even if you don't know it at the time) everything around you could be going crazy, and you can't even move a muscle. Getting home that night I knew that I couldn't wait to see Melissa again. What I didn't know was that I had just gone on my first (non) date with the person I was going to spend the rest of my life with. *Sigh... I sure snagged one of the good ones, huh? Happy 412 days married Sweetie (The Wedding Website told me so!) I love you with all my heart. This post was the ninth and final installment of a new series Confessions of a Newlywed. I hope you enjoyed yourself - I know I did!